DeepSoul: Toto - "Georgy Porgy"
Primarily known for classic rock like "Hold the Line," Toto could also play blue-eyed soul. No need to reread the headline—yes, I'm featuring 1980s supergroup Toto, of "Rosanna" and "Africa" fame, in a column entitled "DeepSoul." Although they may be primarily known for their rock/pop hits, they also display a penchant for blue eyed soul on deep album tracks. The best example of this tendency, "Georgy Porgy," continues to resound in the R&B and hip-hop communities since its 1978 debut. 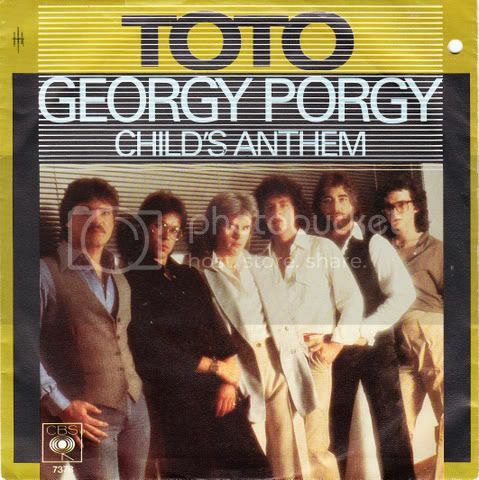 Toto's self-titled first album contains the classic rock tracks "Hold the Line" and "I'll Supply the Love," but "Georgy Porgy" represents a departure for the group. While it peaked at number 48 on Billboard's Hot 100, it fared extremely well in the R&B world, reaching number five on the R&B singles chart. The late drummer Jeff Pocaro played an essential role in the song, as he established the shuffling groove that drives the track. On Toto's website, they quote past Pocaro interviews,where he explained that the song was "imitating all the Maurice and Freddie White stuff; it's imitating Paul Humphrey heavily; it's imitating Earl Palmer very heavily. When it comes to that groove, my biggest influences were Paul Humphrey, Ed Geene, Earl Palmer, and the godfather of that 16th-note groove, James Gadsen. That 'Georgie Porgie' groove I owe to them." He also drew comparisons to another blue-eyed soul artist, Boz Scaggs: "It's the groove on 'Lowdown,' just a different lift of it maybe, a different tempo. I stole all those grooves from those guys, but I may lay the beat just a little bit differently, depending on the song," Pocaro told Modern Drummer in 1988. No matter the influence, "Georgy Porgy" soars with its driving rhythm, funky keyboards, guitarist Steve Lukather's lead vocals, and the guest appearance of 70s R&B/dance queen Cheryl Lynn. Hot at the time, Lynn had just scored her first hit, "Got to Be Real," co-written with Toto member David Paich. Presumably this connection lead to her lending her gospel-infused voice to the track; although she essentially just sings the chorus, her delivery of "Georgy Porgy puddin' pie/ Kiss the girls and make them cry" contains a sensual quality definitely not present in the original nursery rhyme. The 12-inch version of the track extends her parts, further stressing Lynn's suggestive variation of one of the lines: "Kiss the girls and make them high." As for other lyrics, the band clearly had fun playing with phrasing and using sound-alike words, such as in the opening lines: "It's not your situation, I just need contemplation over you/ I'm not so systematic, it's just that I'm an addict for your love." Today, Toto still performs this slice of soul, and the track has popped up in unexpected places. In 1999, R&B crooner Eric Benet put a decidedly hip-hop beat over the recognizable horn riffs, then enlisted Faith Evans to sing Lynn's original part. This "Georgy Porgy," however, allows Evans to echo more of the lyrics rather than just sing the chorus. Eight years earlier, rapper MC Lyte sampled the instrumental track for her hip hop single "Poor Georgie." Clearly this modest hit has lived on in soul circles, and ultimately made Toto an unlikely R&B band as well as a top classic rock group.